بۇ آمریکا یازیچی شیکاقودا آنادان اوْلوب . Also writer and director of Episode: "all things"
1995 Eek! the Cat Agent Scully (voice) Episode: "Eek Space 9"
1996 ReBoot Data Nully (voice) Episode: "Trust No One"
1997 The Simpsons Agent Scully (voice) Episode: "The Springfield Files"
1999 Frasier Jenny (voice) Episode: "Dr. Nora"
2007 Robbie the Reindeer Queen Vorkana (voice) Episode: "Close Encounters of the Herd Kind"
2008 Masterpiece Herself Episode: "Sense and Sensibility"
Robot Chicken Fairy Godmother/Fiona (voice) Episode: "Up, Up, and Buffet"
National Theatre Live Blanche DuBois Episode: "A Streetcar Named Desire"
2015 Top Gear Herself Episode: "#22.6"
↑ The Artist's Garden: American Impressionism. Exhibition on Screen. یوْخلانیلیبMarch 17, 2017. ↑ Hal featuring Gillian Anderson – Extremis Original Edit. یوْخلانیلیبApril 3, 2016. ↑ The G-Files: the search for Gillian Anderson's roots. یوْخلانیلیبOctober 4, 2006. ↑ Gillian Anderson CBC Interview. یوْخلانیلیبSeptember 3, 2015. ↑ Benedict Cumberbatch and Gillian Anderson do it by the book (December 11, 2013). یوْخلانیلیبFebruary 6, 2016. ↑ Sian Cain (February 5, 2016). Russell Brand, Benedict Cumberbatch and Gillian Anderson return to Letters Live. یوْخلانیلیبFebruary 6, 2016. ↑ Letters Live at Freemasons' Hall, October 2016. Letters Live. یوْخلانیلیبSeptember 21, 2016. ↑ Plunkett, John (November 29, 2007). 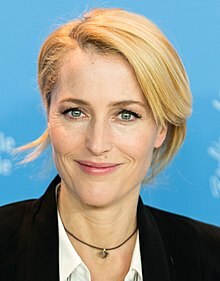 "X Files star Gillian Anderson to appear in Radio 4 play". The Independent. Retrieved October 30, 2015. بۇ صفحه‌‌ سوْن دفعه ‏۱۳ مارس ۲۰۱۹، ‏۱۲:۱۹ تاریخینده دَییشدیریلمیشدیر.